●While my 1503 doesn't work after connecting to USB-C cable? Please check if your USB-C cable is connected correctly. Gechic USB-C cable is designed as 2 USB-A plugs and 1 USB-C plug. You shall plug USB-C plug to On Lap 1503 and plug 2 USB-A plugs to your laptop for power supply. Some laptops do equip with USB-C ports. Please notice the correct connection way. ●Shall I install driver for On-Lap Monitor? Any laptop, camera, or mobile phone can adopt On-Lap Monitor if your device supports DVI / VGA image output. No matter your digital device operates what kind of OS, there is no driver required for On-Lap Monitor. ●How shall I install On Lap Monitor with PC/Laptop generally? In general, please power on your On Lap monitor first by plugging USB Power cable. Step2, please plug in the video cable to On Lap monito and Laptop. We suggest HDMO video input due to the population and high display quality. If your PC only supports VGA output, you may need an optional VGA cable in addition. ●How to use install On Lap 1503 as portrait display?? Refer to the fig. ; remove the 3 screws.Take off the Detachable Stand and put the magnetic buckle into the lower slot. Align Stand's mental latch to the slots on the side of monitor and put monitor into the stand finally. ●Can I adopt On Lap monitors to camera or smartphone? If your camera & smartphone supports HDMI output, then you can connect them to On Lap monitors by suitable video cable or port converter. However, do make sure HDMI output format of your camera/smartphone suits the supported format of On Lap monitos. Meanwhile, some smartphones do require its proprietary converter for HDMI output. 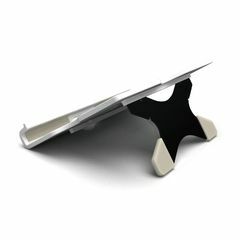 ●Does On-lap support VESA mount? ●Does On-lap support 1/4 screw for tripod? 1101: optional tripod mount kit supports VESA 75 holes and 1/4" screw hole. 1303: optional VESA kit supports VESA 100 holes and 1/4"screw hole. 1503:optional multi-mount kit supports VESA 100 holes and 1/4" screw hole. ●How can I put On-lap vertically? ●Does On-Lap has car mount?How can I install On-Lap in the car? We are sorry that there is no tool to install On-lap in the car.On-lap monitors are designed to use on the desk.It doesn't have the safety certification of car electronic equipment.Therefore,we won't suggest to use On-lap monitor in the car. ●How to install Stand 4? 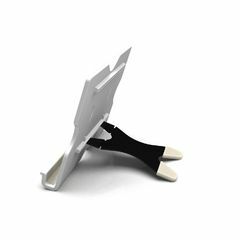 Stand 4 offers 4 different viewing angles and can be adopted to most On Lap Monitors. Please select the designed angle placement to assemble. Insert the X Plate onto the slot and position On Lap monitors on. ●How to remove the On-Lap1302/1501 Holder Plate? 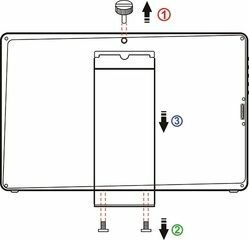 STEP1 Please remove the On-Lap 1302/1501 Monitor first STEP2 Insert a ruler or rigid flat article into the gap at bottom of the Holder Plate; gently and evenly apply force back and forth to make the double-sided adhesive tape lose its viscosity. Do not use metal objects that can easily scratch the surface.